The exact level I was expecting to see tested was the 2008 high at 1440.24, and SPX would generally test the key resistance level and reverse within a few points. 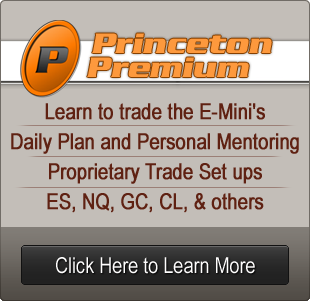 The intraday high yesterday was at 1439.15 so that test has started and may even have already ended. I've marked up the 15yr weekly SPX chart below with the 2009, 2010 and 2011 major highs at key resistance levels, and marked in the previous hits that established those key levels. 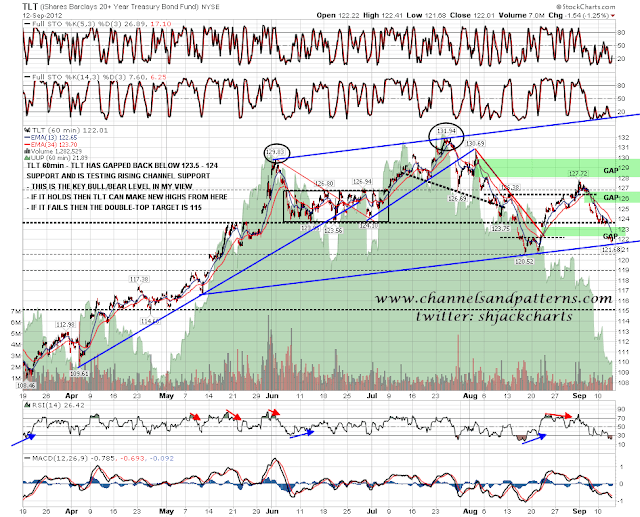 Obviously I mentioned bonds as well as equities, and I have two key levels marked up on the TLT chart. The first is strong support in the 123.5 to 124 area, there was an unfilled gap below that and then rising channel support in the121.7 area. 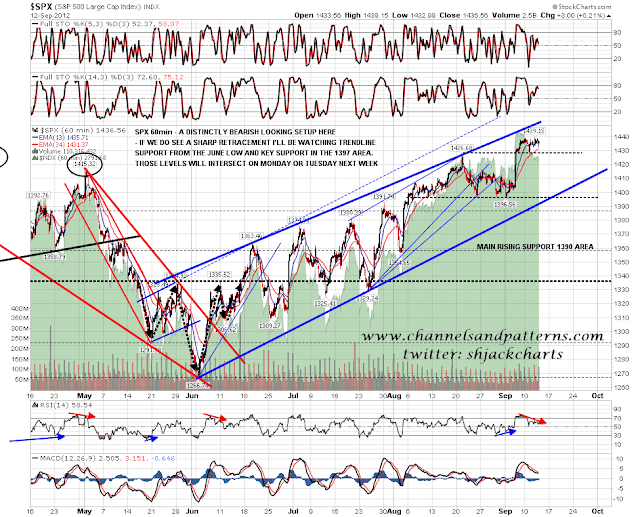 Yesterday TLT gapped below both the 123.5 to 124 level and the unfilled gap below to test rising channel support. If we see a bounce here then new highs on TLT are still very much on the cards, but if support breaks then TLT is in a confirmed downtrend with a double-top target in the 115 area. No doubt the Fed announcement will show which way this will go. Obviously the unfilled gap that was below has now turned into an unfilled gap above. 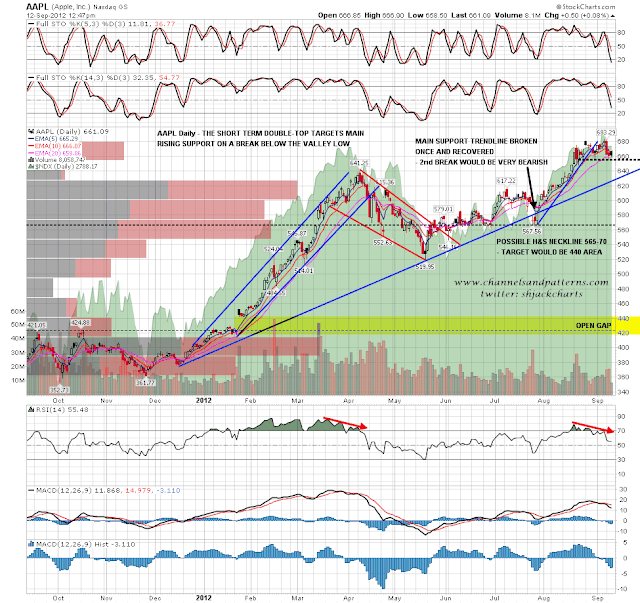 I love Apple products and drew some flak last year when I posted a very bearish looking chart on RIMM in May 2011 with the comment that the iPhone was head and shoulders above any other smartphone on the market.l You can see that post here. RIMM broke support a few days later and I gave a conservative triangle target then at 21 which was hit in midsummer 2011. It closed at 7.42 yesterday. You can see that second post here. Today is obviously a huge wild card day and the consensus is that the Fed will announce some sort of QE3 today. 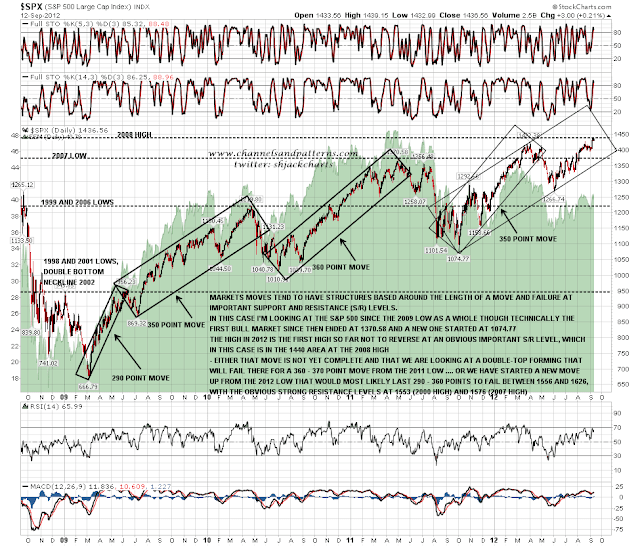 If they're right then SPX will most likely break up and TLT will most likely break down. If we see that happen with any confidence then the technically attractive case for a major top here will collapse, having already been significantly weakened by the strong reversal down on USD. The gold break up isn't good news for bears either. 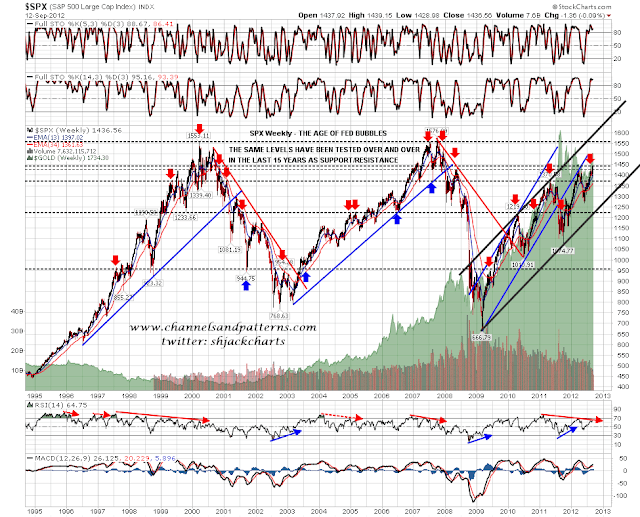 You can see on the second chart on this post that I have used gold as the background to SPX and you can see that uptrends on gold have been strongly correlated with uptrends on SPX since the Fed started easing seriously after the 2000 crash. 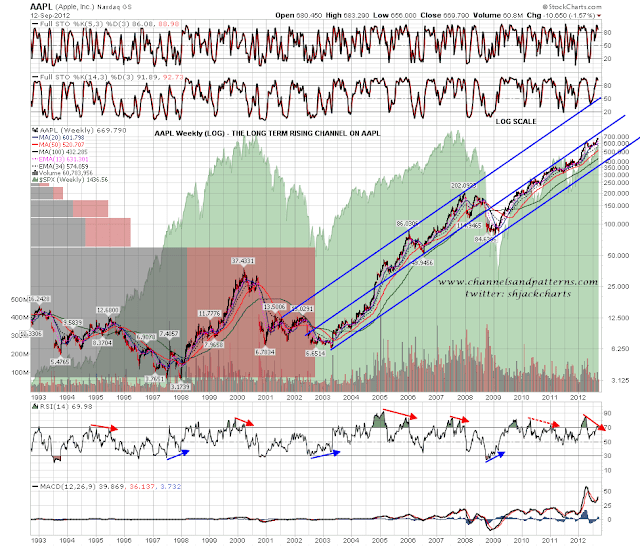 If we don't see that bullish break up then that bear case is still very much alive, and if we are to see a major high in the second half of 2012, then the most likely place is right here and right now. We shall see what the Fed have to say today.